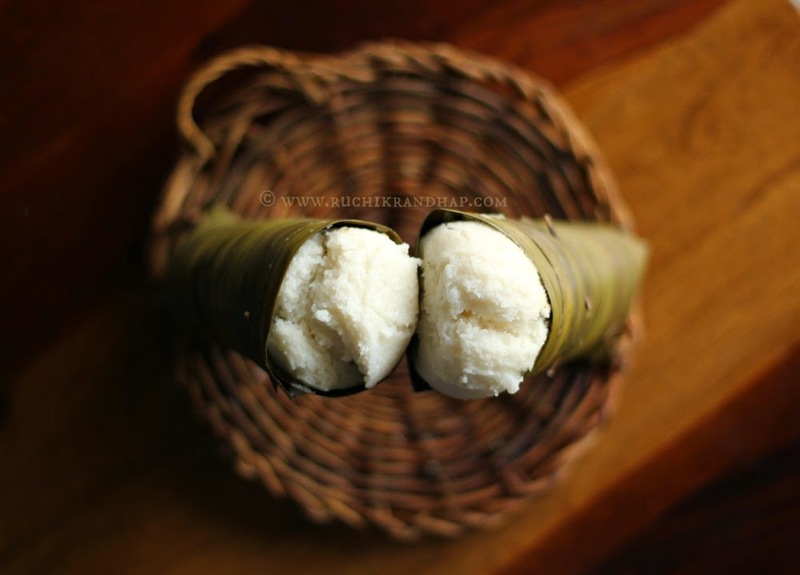 As a South Indian I have had the good fortune of eating many rice breads/cakes and rice based sweetmeats steamed (or pan fried) in various kind of leaves. From sweet dumplings steamed in turmeric leaves to jackfruit pudding steamed in teak leaves I am glad I have eaten them all. Well, almost. 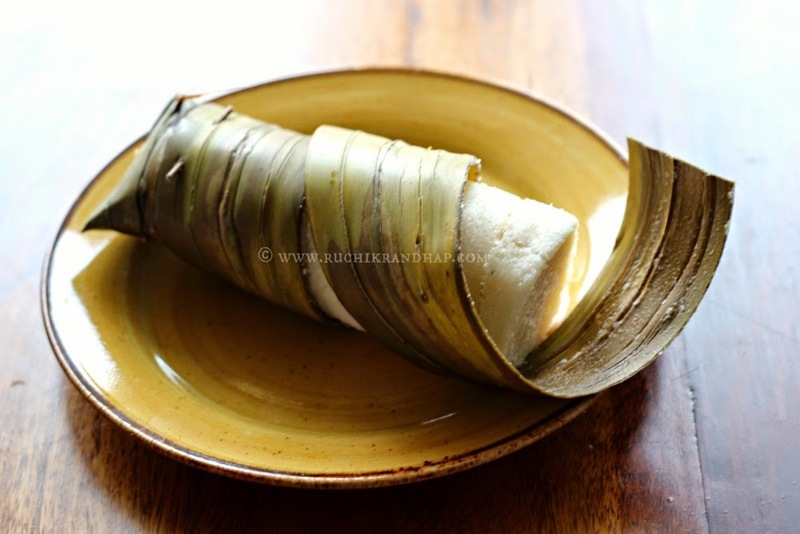 I still have one steamed bread to be tried out and I hope I have the chance to do it on my next trip to Mangalore. On my recent trip there I spotted some of these moulds made out of screw pine leaves. Traditionally they are made at home by the Hindu community of Mangalore but nowadays most people prefer to purchase from the market and as such you may find vendors who sell just that – leaf moulds and perhaps homemade coconut leaf brooms to make a few extra bucks. A day before Nagara Panchami was celebrated in Mangalore, Roshan & I went hunting for these moulds in the downpour. We must have scanned the whole of Car Street and the flower market before landing up at the doorstep of an old flour mill that had closed down years ago but had comfortably housed the paraphernalia of a man who was busy weaving moulds together. I bought my stuff and jumped into the car quickly before the rains got me and off we came. My mum-in-law checked with her neighbour for the recipe and off we set to prepare the batter. We got the batter together and set it aside to be fermented. 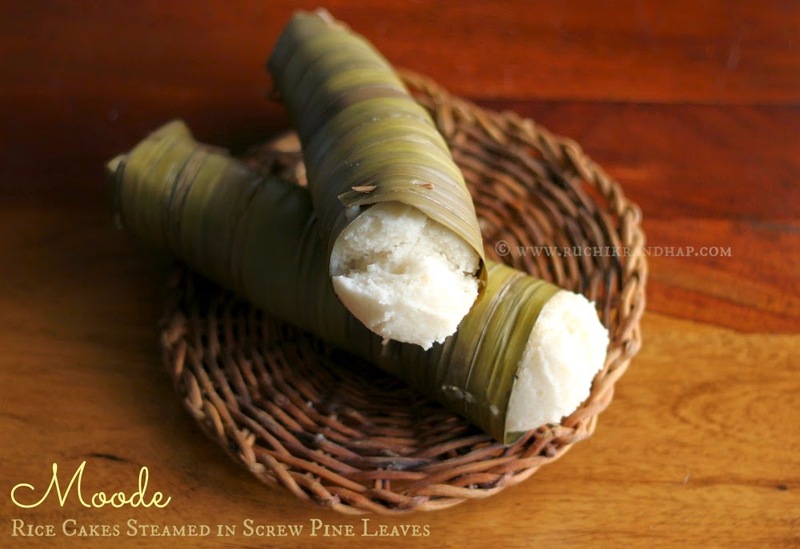 The next morning the house was filled with the delicious aroma of freshly steamed moode – simple idli batter poured into screw pine leaf moulds. These tall idlis delighted us all, especially my son who enjoyed his breakfast very much. 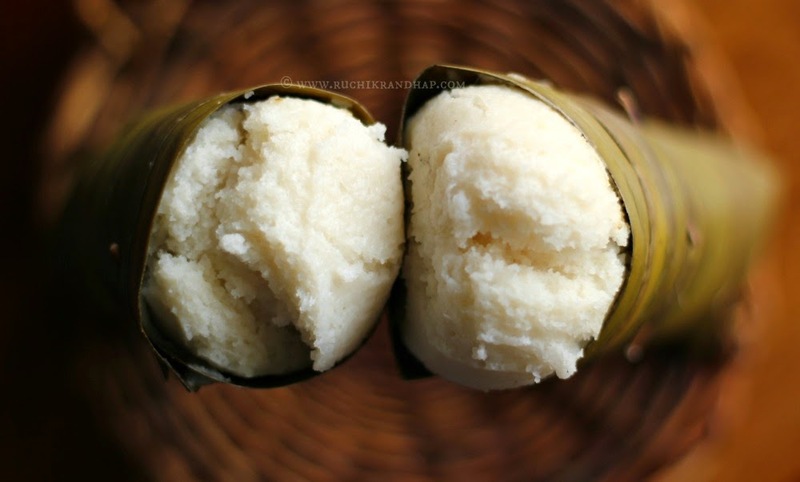 I don’t recall having eaten a lot of moode (pronounced as mooday) during my childhood as it was seasonal and festive preparation that was rarely prepared by my Hindu neighbours. 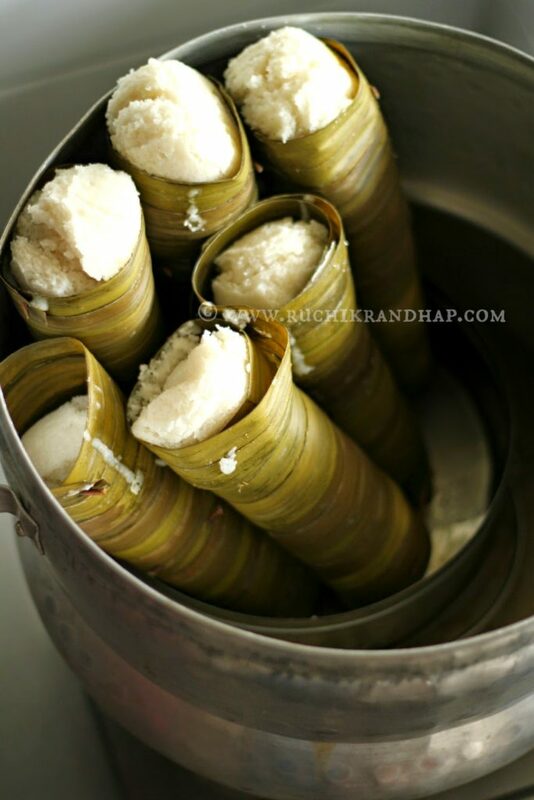 You see most of such delicacies (moode and kottige) were lovingly shared with us during festivals – a practice that was carried out by my grandmom who would in turn share goodies on a platter during Christmas & New Year. I am so glad that for the sake of the blog I managed to find the moulds this time and had the chance to prepare and enjoy them at home, thanks to my mom-in-law and her neighbour! Moode taste wonderful with any vegetarian or non vegetarian curry of your choice. Traditionally it is eaten with padhengi ghassi (whole moong sprouts cooked in a spicy coconut based gravy) – something I have never tried making at home. We ate the moode for breakfast with some coconut chutney and the leftovers were enjoyed with some piping hot chicken curry with coconut milk. Oh deliciousness! My mouth waters even as I think about it! Can’t wait to make and eat them again. Soon! 2. After the soaking period is up drain off the water but don’t discard it, you can use it to grind the grains. 4. Next, grind the rice using a little water to an almost smooth, thick batter. The batter should have the texture of very fine sand (basically a fine rava texture). Pour the batter into the pan containing the ground urad paste. 5. Add enough water to make the batter of medium thickness – if it is too thick the moode will turn hard. Too thin and the batter will likely seep out of the mould. To test, take some batter and drop it from a height – it should fall in a thick, steady stream. Use your hand to lightly yet swiftly mix the two batters. 6. Cover the pan with a lid and keep it undisturbed in a warm place of your kitchen. If you wish you can keep it in the oven which has only the light switched on. 7. The batter can take anywhere between 6 – 12 hours to ferment. In colder temperatures or central AC it can take upto 14 hours. 9. Place sufficient water in a steamer and let it come to a gentle boil. Place a metal stand (used to keep hot vessels on the table) at the bottom of the steamer and over it place a round steel box big enough to accommodate the moulds. 10. Pour the fermented batter into each mould upto two third’s full. Don’t be tempted to pour a lot as the batter will rise and spill out. 11. Let the water placed in the steamer come to a full, rolling boil (steam comes out). Cover the steamer with its lid and let it steam for about 45-50 minutes. You can check around 40 mins by inserting a knife or skewer into the moode. If it comes out clean it is done. 12. 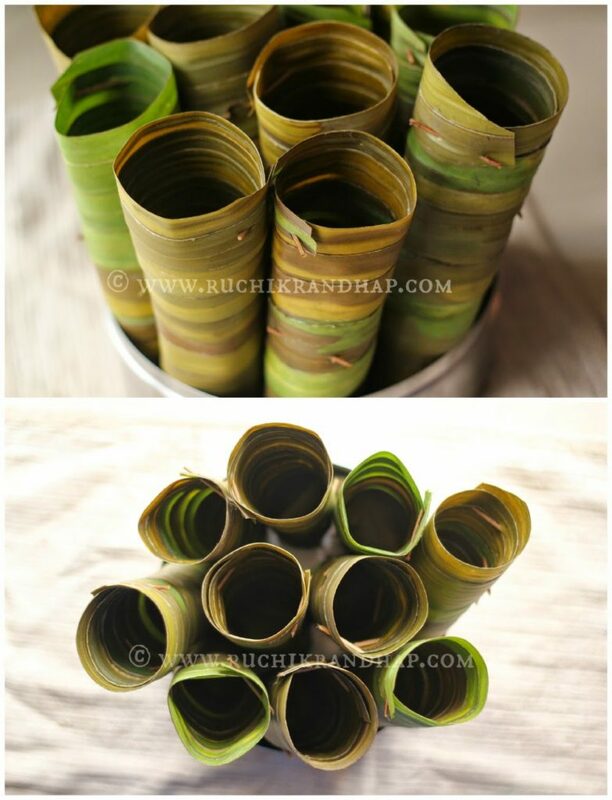 Before serving unwrap the leaf, cut into desired sizes and serve hot with chicken or vegetable curry of your choice. Moode may be eaten with chutney as a breakfast option. 2. If the weather outside is hot and the mixer jar tends to heat up quickly try using chilled water to grind the rice/urad. If the temperature is too hot it could kill the live cultures in the urad that aid quick fermentation. If you are living in central AC, try using lukewarm water to grind. 3. If you are using beaten rice, grind it along with the rice. 4. If you wish you may place ramekins (individual sanna moulds/bowls) inside the steel box placed in the steamer and then position each moode mould inside each ramekin – this is to help the moode mould from toppling over.